Bobby Bradford and Frode Gjerstad's The Delaware River is a high point of contemporary free improvisation. Performed live in Philadelphia in 2014, Bradford (coronet) and Gjerstad (sax) are joined by Ingebrigt Håker Flaten (bass), and Frank Rosaly (drums). The album's title is a reference to the river that Philadelphia lies adjacent to where the concert was performed, but it could also be symbolic of the music played -- the contrast of a steady moving body of water through an ever changing urban industrial landscape. While the album is divided into three tracks, it really is one long piece. "Sailing Up the Delaware River in 1965 was Amazing" is the full title, and it is as enigmatic as one might think -- a biographical reference? The music is just as mysterious. Bradford and Gjerstad engage in complex, cerebral dialogues that draw from many styles and modes of expression -- Bradford, drawing from New Orleans rag, Harlem Renaissance big band, bebop, and free jazz in his music, while Gjerstad draws from his extensive European catalog of sounds, cooler than Bradford's in tone, but just as flexible in creating a myriad of sounds. Haker Flaten and Rosaly, while not as prominent, create the foundation for the others to build upon. Percolating bass and percussion ripple and constantly move like a river, never slowing down nor speeding up, but occasionally creating ripples of agitation. It is difficult to describe the moments and movements of the music throughout; it is best to say it is like hearing two intellectuals in a highly developed and concentrated discussion. They are not noodling; the solos are not self indulgent or showy, nor the interactions exercises in noise making. It is surprisingly even toned; both Bradford and Gjerstad never go full blast. Their sound level is medium to light, occupying a medium to medium high register, never shrill. It plays off well with the rhythm section, restless and searching. It is also very spiritual, because of their register of play, the music feels uplifting, especially toward the end, where the lead musicians vocalize, like abstract sermons in a church. 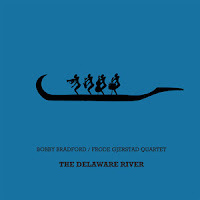 Bradford and Gjerstad have collaborated for almost thirty years, when they were members of Johnny Dyani's group Detail, and their level of play is at a very high level here. Not for the casual listener, but rewarding for those seeking quality free improv. Recommended. "Silver Cornet" (Nessa Records) with the same quartet was recorded the next day in Chicago. I think Silver Cornet was recorded the next night in Baltimore. I wonder how much the two albums overlap. Good description of Bradford and Gjerstad's styles of improvising. Frode has played here frequently but not with this group. I never tire of hearing him.